Jonathan Papernick is the author the story collections *The Ascent of Eli Israel*, *There Is No Other*and *The Book of Stone*. His fiction has appeared in numerous literary journals including, *Nerve*, *Post Road*, *Green Mountains Review*, *Night Train*, *Blunderbuss*, *Folio* and *Confrontation*. His work had been anthologized in *Lost Tribe: Jewish Fiction from the Edge*, *Scribblers on the Roof*,*The Moment,* *Sudden Flash Youth* and *Six-Word Memoirs on Jewish Life*. Dara Horn calls Papernick “an utterly original writer,” and the New York Times writes, “There is a muscular certainty to the best of Papernick’s stories.” Papernick has taught fiction writing at Pratt Institute, Brandeis University, Bar Ilan University, Emerson College Grub Street Writers and Emerson College. A Toronto native, Papernick lives with his wife and two sons outside of Boston where he is a Senior Writer-in-Residence at a Boston-area college. Rachel Sherman: Can you describe the journey of writing The Book of Stone? How did it take you to finish? What inspired the idea? 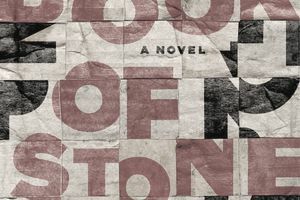 Jonathan Papernick: *The Book of Stone* took me a long time to write. I actually started writing it in September 2000 after my first collection of stories *The Ascent of Eli Israel* was circulating with New York publishers. I had dealt with the theme of Jewish extremism in the collection of stories and felt that I had not yet purged myself of the fascination so I decided I wanted to write a novel set in Brooklyn, where I was living at the time. Interestingly, the novel started to come together during a radio-less drive from Wesleyan University to Fort Greene, Brooklyn. First, the protagonist’s father, the monstrous judge Walter Stone started to form in my mind. At the time, my father was trying to become a judge in Canada and was not having any luck, and I wanted him to see that not all judges were great people and that there was no shame in not becoming a judge. I also knew that my main character was a lost young man in his mid-20s who was estranged from his father who had just died. And I knew that my character would begin the novel on his rooftop considering suicide. Beyond that, it was really difficult to put this novel together as I knew I wanted it to make my collection of stories look PG by comparison, I wanted to write something explosive, inflammatory, something that would really create discussion and debate. I wrote for a long time in the dark, not knowing how to get where I wanted to but pressed on and after two or three years the narrative started to fall into place. Once I hooked up with my wonderful editor Michelle Caplan at Fig Tree Books early in 2014, the writing process really took off. I pretty much rewrote the book with her pushing me to always dig deeper to make my characters more dimensional, to push them harder, to really take chances and eight months later, I had a one hundred and thirty-five thousand word manuscript that is the book we have today. Can you talk about your experience publishing this book with Fig Tree Books? What makes Fig Tree different from other publishers? My experience working with Fig Tree has been wonderful, firstly because of the close relationship I was able to have with my editor. With my novel being one of the first four books they are publishing on their inaugural list, I was given lots of attention not just from the editor, but from everyone else at the publishing house. I know a lot of larger houses may seem more prestigious, but it is easy to get lost in the shuffle, and I always felt that my book was of great concern not just to me, but to the very future of Fig Tree, as they wanted to make a big splash in the literary world. I think they are special, not just because of the attention that they give to their writers, but also because they are unafraid to take chances and really work with some difficult subject matter, novels that more mainstream publishers may be afraid to take on. Nobody at Fig Tree ever asked me to tone anything down, in fact quite the opposite, I was told not to pull my punches and to let the novel go where it needed to. As your book deals with many controversial topics, have you had any reactions that surprised you? Since the book has been out for less than a week, I haven’t had that many reactions yet except for a few prepublication reviews that were extremely positive. There’s a part of me that imagines some portion of the Jewish readership may see this book as “bad for the Jews,” which I think is a ridiculous idea to begin with, but it would be an excellent starting point for a very important conversation about extremism. What is your day-to-day working life like? How do you structure your writing time? Since I teach full-time at Emerson College and have two young kids it is not always easy to find time to write. I tend to be a “streaky” writer which was certainly put on display with this novel when I rewrote the entire book in eight months. Often times I was writing six and seven hours a day, but I can also go months and months without writing. Although sometimes I feel guilty about it, I do think the brain needs time to recharge, and a writer is always writing in the sense that he is always gathering ideas in his subconscious, nurturing those ideas until they’re ready to spring to life. With a family, however, it is a bit of a negotiation, and I did have to check out a fair amount in order to give my novel the time it needed for it to come to life. Well, my basic advice is that young writers need to read and read everything and read constantly - both contemporary writing and classics. They need to feel that they never know enough. I believe we are always students of writing, whether we are young or old – there is never a moment when we arrive, when we can say we have made it, it is a constant process. It is also important for writers to sit down in the chair in front of the computer or pad of paper and get the work done. There’s nothing fashionable about being a writer, it is about the loneliness of putting something down on the page and then revising and revising and revising until it feels absolutely right. Writers young and old need to balance arrogance with humility. When we sit down to write, we are creators, gods in miniature and we need to write with the greatest sense of arrogance, as we are creating real, multidimensional human beings, worlds which spring to life from the page. However, when we go out into the world as writers, we need to present ourselves with great humility. There are so many things that people can be doing with their time, whether it is watching a movie, or playing video games or hanging out with friends, and there are thousands and thousands of books published every year, and there is no reason for anybody outside of our own personal circle for somebody to read our books, especially if we are arrogant or entitled in any way. Writers need to present themselves in a friendly, approachable way, understanding that we are asking a lot for someone to spend five or six or more hours alone with just our words to keep them company. Jonathan will be reading at Greenlight Bookstore in Brooklyn NY on May 18th at 7pm. His other tour dates are listed here.